My site is no longer sending out emails using either SMTP or mailphp(). This is what I found in the error logs after requesting a password reset. Any help in this matter would be wonderful. 1) Please make sure that this file contains entry of email "_EMAIL_FOOTER_MEMBER_". 2) If not, please add below content at the end of this file "/application/languages/es/core.csv" and translate the right part of each phrase according to "es" language pack. "_EMAIL_FOOTER_MEMBER_DESCRIPTION";"This can be added to other emails using the [footer] placeholder." Once above code is added, please clear error log and hope you'll not see the error again. If the problem still persists, please try contacting our support team along with your site's details to enable them look deeper into the problem on your installation. I am trying to find someone experienced in bug fixing or atleast make the following modules usable. I purchased 10 modules from YouNetco and out of which 8 have bugs and are not usable. All the following modules generate plenty of errors and increases the size of error log which makes me delete the log file manually every day to prevent crashing of my server. Half of the features as promised while selling the modules do not work. They do not respond to tickets in time. They reply with automated text to 1 ticket once in 4 to 6 days. Over a dozen tickets are stinking with no response. I have already bought their modules and they neither refund nor reply to tickets. Members who have knowledge in bug fixing of the following modules to make it usable, please write me here. Its the same issue with the plugins we bought from YouNetCo. The YouTuba Channel Plugin doesnt save the channel giving PDO errors and Advanced Video doesnt save the Video stating file not found after uploading and YouNetCo doesnt listens and responds to tickets. If you're open to "outside the box" solutions, and are still in development (i.e. no live data to convert), you may want to consider replacing Plugins. I only suggest this because (my quess) is that it will be much less expensive (in the short term and long term) to switch to something that works rather than fix (and keep fixing) bad Plugins. SEAO offers Directory/Business (with many useful extensions, depending on your needs), Advanced Search, (advanced) Groups/Communities, Advanced Member, and Advanced Video plugins (you may have to compare SEAO's to younetco's for your specific needs. SEAO's Multiple Listings Type Plugin (MLTP) might work for Job Posting and Resume (again, depending on your requirements), and the good news is that the MLTP may be used for as many Listing type purposes as you can dream up. As far as Ultimate News goes, I don't have a suggestion. gs I hope you don't mind the suggestion: have you tried SES' All In One Multiple Forms Plugin? If not, I'd highly recommend checking out the demo. I've only been using it for a short while, but it's a very useful plugin - even if only used to create a more useful Contact Form. Just my 2 cents. Dave I really apologise folks. I can't seem to find a place where I can explain a bug in the contact form on my landing page. I tried to insert a couple of screen grabs to show what's happening, but they overwrite each other. Anyone want to have a look, go to www.travelinks.ca and click on the contact link in the footer. 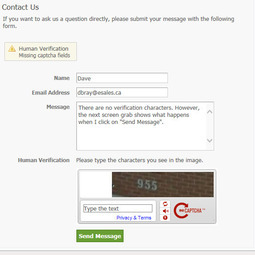 No captcha challenge until you click send. Isn't there an easier way to report bugs than having to pay for support? Frustrating as the dickens when something doesn't work and they want me to pay them to fix it. Just sayin! SE 3.0 files still Pulling up on SE4 - How to Delete SE3? SocialEngine PHP MGR Hi [175338,MMAMELEE], This is not a known issue in our software or the importer that is used to migrate content from v3 to v4. Looking at your website and these links, it seems that both the instances v3 and v4 are existing at your end because of which this issue is coming. To enable our team look deeper into this problem on your installation, I'll suggest you opening a support ticket along with the details of your website. Thanks. Anyone update to 4.8.9 PHP Yet? Louis Belcourt my site sylviobelcourt.com is fairly new and I have upgraded from a previous version to 4.8.9. It was running very well but under 4.8.9, it is very slow to load the first page as well as other plugins. Not sure why at this stage. I'm doing more research to find the cause. Anyone had the same issue? get a title like this: “LAST UPDATED ON JANUARY 20, 2015”. down. How can I fix this problem? Has anyone experienced the same? I am using an old version of SE PHP (v4.1.3) and having a problem with the YouTube AP. The problem is with the retrieval of the title and description of a posted YouTube video. Any information or help would be much appreciated! I have just set up a new website http://www.bbhq.net and even though there is no invite to attack the site, I am getting loads of vulnerability reports in SocialEngine. I would like to put a copy of my site up on hackerone for it to be hacked, but I need the assistamce of SocialEngine for this exercise as clearly any bugs reported would be in this product and would require fixing. It costs nothing to do (if you are not offering rewards for bugs), but would be an excellent thing to do to help protect SocialEngine customers and users of their websites. Please could someone from SocialEngine contact me - mark@blsecurity.com so we can discuss this. A project like this benefits everyone. Mark Litchfield Sorry, I am new to this forum. Okay, I will endeavor to get this set up over the next couple of days. Mark Litchfield Great. I was hoping for a more involved approach than just a support@ address. Do you not have a Security@ address ? When this "hack challenge" is launched, I think you will be extremely surprised as to the amount of submissions you will receive in a very short period of time. Can you please tell me what the problem is? Hi, I have installed social engine and I am not even able to log in as admin. And it only shows a small login window. Same problem in another of my sight. http://kenyadiasporaconfederation.org/. Anyone encountered this or is aware of what causes this, and how to rectify it? Please Help since a week i can not add friends ?? i have the problem that my popup window to small and i can not press ok .
the smoothbox dosent work more a get a small window , has somebody a idea about that ? PBWM I have the same issue with Integrity Theme by [73,seTweaks]. In Chrome browser smoothboxes just don't work fine. It will be great this to be fixed!